There seems to be a change in the meaning of community for most people in the mosaic (also know as millennial) generation. Less satisfied with surface level conversations and desiring a deep connection of doing life together. There are signs of this seen in intentional communities in a movement named the new monasticism. Communities like The Simple Way in Philadelphia, Communality in Lexington, or Rutba House in North Carolina. Places people have been engaged with an ideal that is so old, it’s new again. Living together offering hospitality and community for the glory of God in everything. Inviting people from the streets, other walks of life, or anyone that wants to learn what it means to follow Jesus in the context they’re in. Places like these make me incredibly excited about the position the church is in to speak to a world divided. One of the great things I feel the internet has allowed us to do is expand our global consciousness. We can see people from all over the world and do more than just feel empathy. Empathy can allow us to see with the eyes of Christ the situation of people hurting and compassion is accompanied by a desire to do something about that suffering. There is something unique about being received in a home. It’s not a neutral place like a coffee shop or a church building. There is a certain amount of vulnerability that comes with inviting people into your home. Our pastor says that he can tell more about a family after spending time in their living room looking at pictures and telling stories than in any other setting. I completely agree. This is why I think the new monastic movement can seem so appealing. People with a desire to live intentionally and transparently with fellow Christians as a way to build up the body of Christ, can’t hide or put up a front with people in which they live. So one of the first things I see is there is a longing for connection with fellow believers and a willingness to invite and be invited in the lives and homes of the people around them. There is grace in the hospitality of listening and meeting in homes and not keeping people at a distance in a neutral location. Reading a little further I noticed this passage from Acts 4:32: “now the full number of those who believed were of one heart and soul, and no one said that any of the things that belonged to him was his own, but they had everything in common.” Most people I know enjoy their privacy too much to hold everything in common and that is okay. But what my mind can’t escape from was how they were so united that they had one heart and soul. With the amount of division in the church what would it look like to be of one heart and one soul? Reading though Paul’s letters I see him over and over pleading for the unity of believers. We need to rediscover what unity in professing Jesus has been resurrected from the dead and is Lord means for the world and not just for an individual congregation. This also means that there has to be an abundance of forgiveness. Not only is forgiveness hard, but it can be a form of suffering. This suffering in the Christ model of forgiveness leads to a death, a death of the thing that offended you, the thing that made you made, the thing that you couldn’t stand, and leads to a resurrection. Jesus prayed on the cross for those who crucified him to be forgiven and I’m sure that didn’t feel good. However, three days later it led to an empty tomb and life everlasting. Sometimes we need to let go by forgiving others, however painful, because we know that pain and death leads to resurrection and new life. I say all these things as I desperately try to figure it all out myself. Wondering how my actions affect unity, forgiveness, grace, hospitality and community. I believe community is built into the fabric of the cosmos, we desperately seek for it. And at the center of our searching the universe is the Trinity. 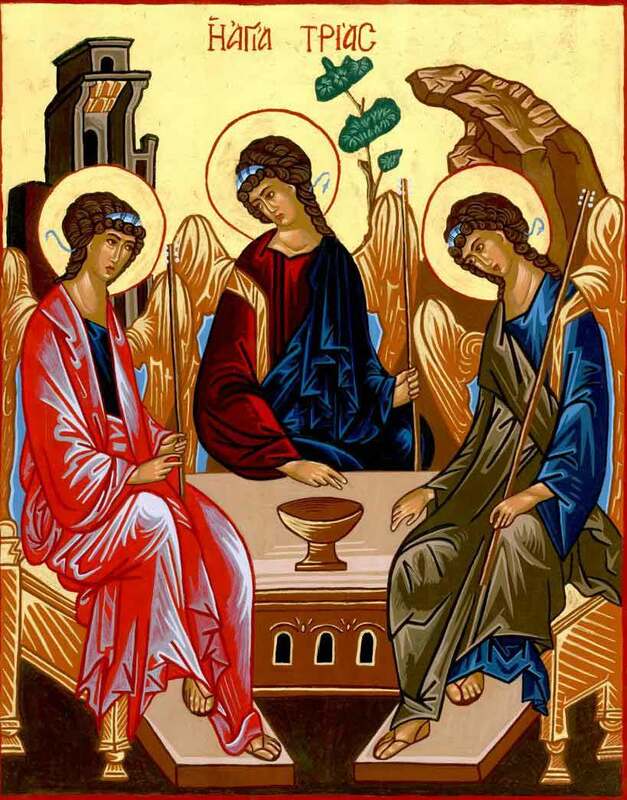 The Father, Son and Holy Spirit in a constant state of self-giving love, grace, hospitality, forgiveness, and community. The three in one God knows why we seek for community and connection. He invites us to his table (literally at the Eucharist) and asks us to join Him: Father, Son, and Holy Spirit, as he writes a love letter to the world using our lives as His pencil. the connection between note writing and encouragement is? It might not surprise you to know that I’ve been described as a social butterfly. In the same way that I love to interact with people in real life, I find a lot of enjoyment in social media. I know there are a lot of downfalls like becoming too addicted or attached, but if used properly this tool is an amazing way to communicate and connect. The “used properly” clause is the hard part about social media. E-mail is the same way. It’s a great way to communicate information instantly. The trouble is when e-mail or facebook, or twitter becomes your source or base of friendship or truly communicating worth or value to another person. As a youth pastor I recognize that there is pain and lives are being saved because of social media. Immediately when I step in my office some of the first things that I do when booting up my computers is check my e-mail, then facebook, then twitter. But the things that give me the most encouragement, the things that make my job worth doing, don’t happen in the cloud. The other night I received a voice mail from someone I consider a role model when I become a dad. Sometimes when a voicemail is left after 9pm from a parent, I get a little nervous, was someone in an accident? Will I be driving to the hospital soon? But the voicemail I received brought so much joy to my heart. It had nothing to do with something I did wrong, it had nothing to do with issues they were having with their children or a tragedy. The entire point was to encourage and lift me up in prayer, making sure I knew what I was doing mattered to them and to our church. I will not ever be deleting this voice mail. Too often when we are in a hurry to try and add more “things” to our schedule we forget to encourage one another in the faith and the things God is doing in our midst. I started talking about social media and e-mail because when it comes to encouragement and being thankful for people, this is a pet peeve of mine. There is something about receiving a mass e-mail thanking me along with many other people that I appreciate but don’t always feel encouraged by. When I receive things like a late night phone call just to say thanks, or a hand written note, it communicates a sense of worth that I don’t feel many places. In youth ministry in order to communicate about events we often do a “mass mailing” or e-mailing in order to get details to parents or students. But I’ve never felt comfortable about this. If we really have the desire to encourage kids to come to an event that we know God is going to show up at is this the best way of being a good steward of our limited time here on earth to spread the gospel? I can’t be satisfied with “it’s just the way we do things” anymore than Jesus was satisfied with the practices of the religious when he walked the earth. He was constantly challenging the accepted ideas of how things should be done and the spirit in which they were accomplished. In the places we live and work, even if it might be considered a bubble, there is a need to be encouraged to do the right thing in the middle of a world that doesn’t want us to always follow Jesus. The early Christians did things that were completely counter productive to the ones who observed them, they spoke gently to those who persecuted them. Do we even speak gently to the ones who don’t give us the best customer service at a fast food restaurant? They gave ungrudgingly, and took care of those who were in need. I firmly believe one of the only reasons they were able to accomplish these things was because of the encouragement they received. Acts 15: 31 describes the reaction of Christians in Antioch after reading a letter sent from the apostles and other elders of The Church: “and when they had read it, they rejoiced because of its encouragement.” I have taken up a challenge for the month of August to write at least one note everyday. It is my hope that when others read the words that I write they will rejoice because of its encouragement to go and be more like Christ. Note writing is obviously a lost art for many people, which is why it’s so surprising when we receive them. They are memorable, you read them over and over again sometimes never throwing them away. They communicate value in that a person would take time and care enough about you to use their own hand, at risk of getting a writing cramp, and put ink to paper. When you receive hundreds of e-mails in a given time period, a note stands out. 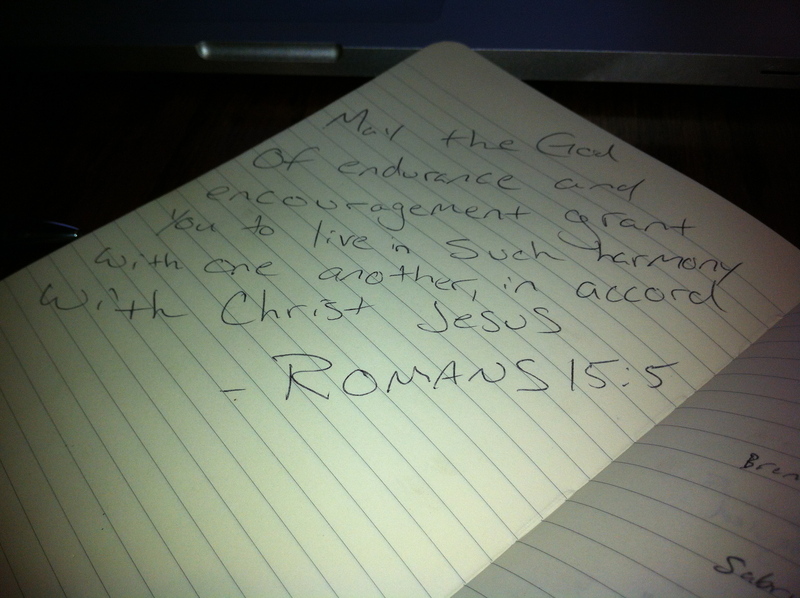 May we all feel more encouraged by the same spirit that raised Jesus from the dead living within us! Amen.